The long-awaited relaunch of Condé Nast recipe platform Epicurious finally rolled out this morning, boasting a fresh look and a tagline as "the ultimate food resource." The core mission of the redesign was to create a utility for home cooks that would combine the site's trademark recipe curation with a new focus on technology and personalization, said Pamela Drucker Mann, publisher and chief revenue officer of The Food Innovation Group (which includes both Epicurious and Bon Appétit). The new site features a more streamlined design that places the most-used features front and center. The search bar is now the focus of the homepage and includes a new auto-complete function and displays trending search terms. (Eventually, the site will be able to tailor your search results based on your recipe-viewing history.) A new slideshow format allows viewers to click through multiple pictures on a single page. There's also a heavier emphasis on high-quality photography, with more in-house shoots replacing stock images. Editorially, the core strategy remains quality over quantity. "We don't have the biggest recipe database on earth, but we have the right recipes," said Epicurious executive director Eric Gillin. In addition to content created by Epicurious editors—such as the "How to Cook Now" launch package—which includes a guide on how to make a Shake Shack burger at home—the site will also include selected recipes from Food52 and HarperCollins Publishers. For visitors who aren't sure what to cook, the site has two new high-tech tools, Cook It and Food Forecast, to suggest recipes. The Lexus-sponsored Cook It, which Gillin described as "Tinder for recipes," asks users whether or not they would cook a handful of different recipes and then suggests dishes based on those answers using an artificial intelligence algorithm. Food Forecast, created with and sponsored by The Weather Channel, suggests recipes based on the weather conditions in the user's current location. The Food Forecast widget will also appear on The Weather Channel to promote the Epicurious relaunch. In addition to Lexus, the site's launch sponsors include JCPenney (which will be rolling out a line of Epicurious-branded cookware on Feb. 5) and Nutella. 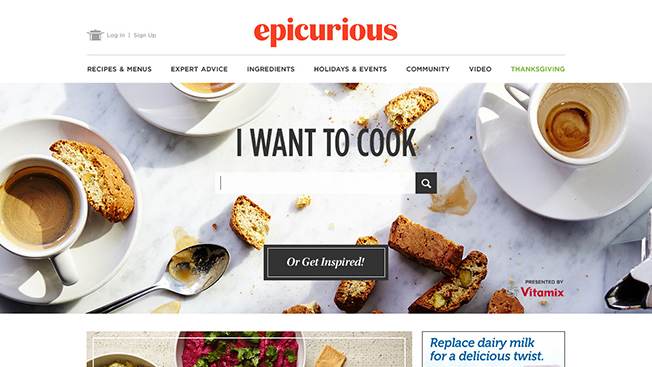 About half of the advertising on Epicurious.com will be dedicated to native, said Drucker Mann. The new Epicurious is the result of a year and a half of constant strategy and leadership changes. In October 2013, Travel + Leisure alum Nilou Motamed was brought in as editor in chief to lead a (never fully realized) relaunch with an increased focus on lifestyle and travel content. Then, last August, it was announced that fellow Condé brand Bon Appétit would be taking control of Epicurious, with Bon Appétit's editor in chief Adam Rapoport overseeing editorial content and Drucker Mann overseeing ad sales. Finally, in September, Motamed departed Epicurious and was replaced by Gillin, who had previously been the site's director of product. According to Drucker Mann, Gillin's experience on the product side made him the ideal person to lead the new site. "The great thing is that he understands both content and technology," she said. "He can help come up with the idea but also knows how to make it work."